Interweave store is a well-known crafts store, but have you looked at Interweave for quilting? 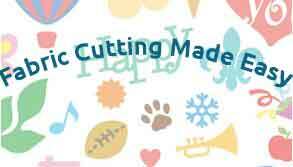 The dedicated quilting section offers everything you could want to satisfy your quilting passion! They also have a membership section which is free to join and gives you access blogs, forums, videos, and free stuff! Quilting patterns – Lots of free quilt block patterns, sewing patterns and projects to encourage creativity and inspiration! There are patterns for home decorating, women, men, children, babies, and more. Each pattern incorporates techniques ranging from patchwork and embroidery to embellishment and surface design. You can download any pattern instantly, no more waiting for the post to arrive! One click and you can get started on your beautiful quilting project. Quilting kits – Every month Interweave bring you new kits which cover free motion quilting, embroidery, embellishing, patchwork and more. They pay attention to popular quilting trends and deliver kits accordingly. The kits are time limited so if you see one you like make sure you snap it up before it’s gone! Quilting books – Whether you’re looking for inspiration or want to brush up on old skills then the quilt studio library is the place to visit. You’ll find books from the top quilting artists and get inspiration from the design, textures and colours from them. Find a whole new quilting world by treating yourself to some books. Digital products about quilting – For those of us who love the latest technology, this section is for you. Interweave digital products make sure you can take your quilting inspiration with you with eMags, magazine downloads, webinars and workshops available. Interweave helps you keep up and never be without quilting inspiration. You’ll find tips, tricks and techniques from well-known quilters. A wide range of magazines – A large selection of quilting magazines is available, suitable for beginners and advanced quilters. You’ll find instructions for innovative stitching, surface design techniques, modern quilting and patchwork in Interweave’s magazine section. FREE stuff! – Tutorials and videos and downloads for your quilting projects. There are a number of free ebooks to download, many suitable for beginners. One I particularly liked the look of is 7 Small Quilting Projects, it’s now downloaded and ready for future projects! 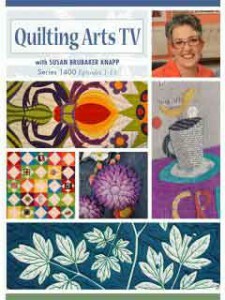 Quilting Arts TV DVDs, current and past seasons. Download Quilting Arts TV projects. We are generally very visual, images and videos tend to draw the eye more than written text. Many people learn and absorb more efficiently by watching, rather than reading or listening. Quilting Arts TV at Interweave offers something for everyone, whatever your level of expertise. Traditional quilt making is covered, as is fiber art, sewing, mixed media techniques, surface design and more. There are many quilted project ideas you can make including home decor, quilts, quilted clothes and bags. Top quilt artists and designers, as well as mixed-media artists join Susan Brubaker Knapp to share their expertise in art and design concepts for quilts, including surface design techniques. The series also covers free motion embroidery, fabric collage, quilting with alternative fabrics, mixed media, quilted home décor, as well as traditional quilt making. Check out this preview from an episode titled Focus on Feet. In this episode, contemporary quilting designs are created by Catherine Redford using a walking foot for quilting. Getting started with free motion quilting is explained by Sarah Ann Smith using a darning foot. Interweave for quilting is a great resource, and best of all the membership is free! Wouldn’t you like to learn more? Pop over to Interweave and find out what they have to offer! The coolest thing I find about quilts is how they tell a story and the amount of time and love put behind each one is really what makes it soo special. You are a great resource and seem like you would be an excellent teacher. My sister quilts, and I think that she will love this site! There is so much helpful info here! This is a really nice place and it has very good information… I love quilting, and you provide useful information on where to find more. Thank you for writing about this. Hi Kathy! I tried to find out more about the great lady who created this awesome quilting website, but I think the about me might be “broken” or something. Just to let you know. Interweave sounds like a great service. I also noticed that you like Trupanion. We are getting a new puppy TOMORROW and were just looking at Pet Insurance in preparation for our new, furry arrival. I am going to tell my in-laws about your site as they are all avid quilters. Me, not so much, but I’m so glad I stumbled upon your site today so I can share it with them. 🙂 Actually, I will share it on my facebook and direct them there! Great idea. Have a wonderful day. Hi Dianne, apologies for the about me being broken, I’ll get that fixed asap! Very exciting about getting a new puppy, let me know how it goes. Thanks for sharing my site with your in-laws, I hope they enjoy reading as much as I enjoy writing!